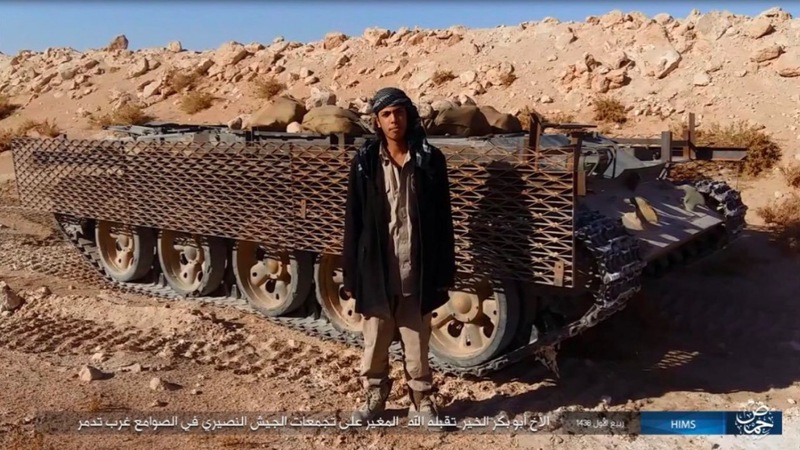 The Islamic State’s (IS) extensive acquisition of military armoured vehicles from government forces in both Syria and Iraq has been a well-documented phenomenon. Especially during their initial massive expansion in the 2013-14 period, but also sporadically over the years. These seized main battle tanks (MBTs) and armoured personnel carriers (APCs) were often refurbished in workshops across the group’s territories, before being re-inserted onto the battlefield in their stated roles. MBTs in either an offensive or fire support role, with APCs reserved for shuttling fighters. However, the abundance of military armoured personnel carriers in IS possession coupled with their own mass-production of improvised troop transport vehicles meant that a substantial number of the Soviet-made APCs (mostly BMP-1 variants) could be overhauled to function as up-armoured SVBIEDs instead. 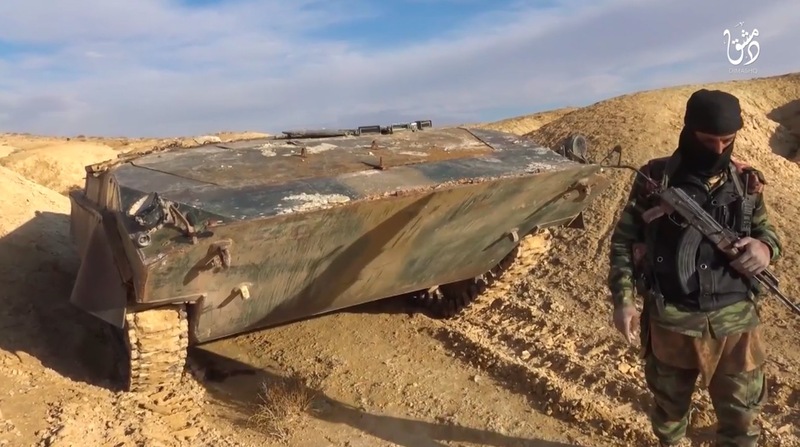 Although the armour on the BMP-1 is comparatively thin, it’s still far thicker than that of any civilian vehicle. And since APCs are designed to be able to carry as many soldiers as possible in one go, they naturally have a large rear storage space for an explosive payload. For example, the BMP-1 can carry upwards of 8 passengers on top of a crew of 3 people. Tearing out unnecessary parts of the rear interior further increases the vehicle’s carrying capacity. 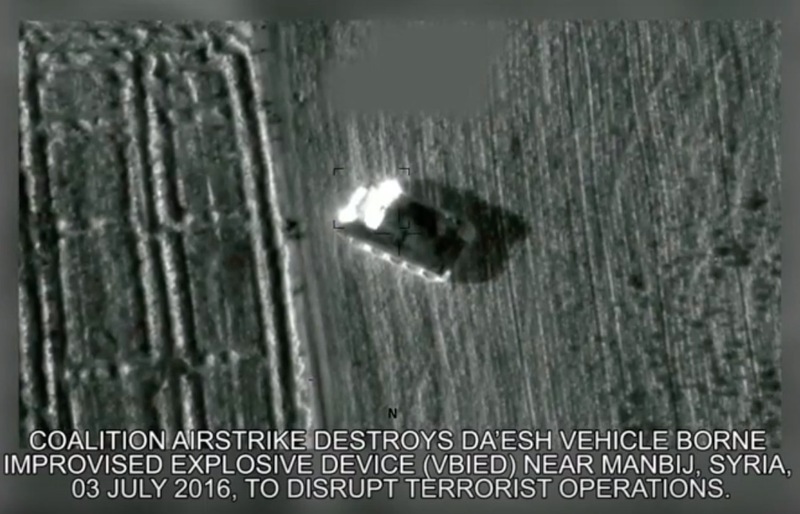 The fact that the vehicle type is tracked also increases its offensive capabilities in off-road environments. Together, all of these factors made the BMP-1 a sublime choice for use as an SVBIED shell. On the other hand, main battle tanks (MBTs) are very rarely employed as SVBIEDs – And there are a number of reasons for that. First and foremost, MBTs are far more important when used in their stated role, than when overhauled and used in a one-off SVBIED attack. Secondly, the abundance of other types of military armoured vehicles better suited for SVBIED conversion makes it even more illogical to use tanks as shells. Also, compared to the often spacious armoured personnel carriers, tanks typically have a very claustrophobia-inducing interior, which in turn means less space for the explosive payload. The one advantage of using an MBT hull as an SVBIED shell over an APC is the considerably tougher frontal and side armour on most MBTs compared to what can be seen on armoured personnel carriers like the Soviet-made BMP-1 variants. There’s very few reasons for using functional MBTs as SVBIEDs, with “functional” being the key-word here. Despite all the drawbacks I’ve mentioned, there’s actually around a dozen recorded cases where (Soviet-made) MBTs have been employed offensively as SVBIEDs. 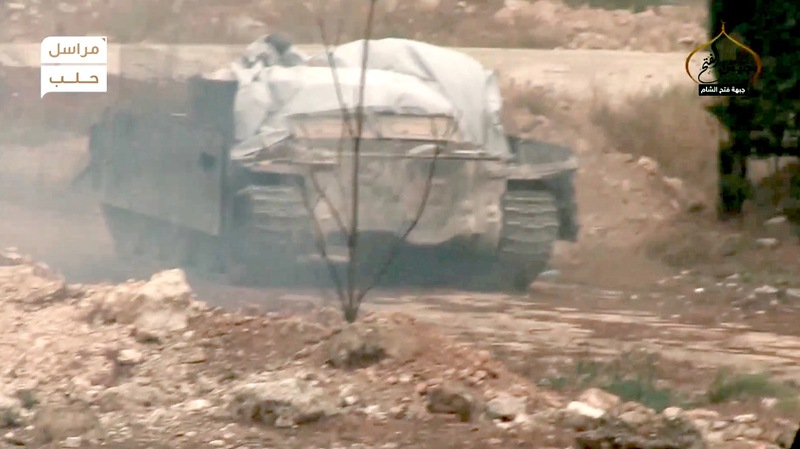 When tanks are used as SVBIEDs, it’s almost always because the barrel or turret has been damaged in battle, rendering the vehicle inoperable in its stated role. In those cases, it instantly makes more sense to use the tank as an SVBIED. The remaining cases where there had been no visible damage to the barrel or turret, but the MBT had still been converted into an SVBIED, it might be because of a lack of better suited vehicles in that specific area, or a hardened target on that front requiring a sturdier SVBIED shell. In this section I will be showcasing all known recorded cases where an MBT has been used as an SVBIED. As you’ll see, all of the examples are based on older Soviet-made MBTs, such as the T-55 and T-62. There are however a few exceptions to the rule. Geographically speaking, IS employment of MBT-based SVBIEDs has mostly been restricted to the Deir ez-Zor area of Eastern Syria. The first recorded case of an MBT-based SVBIED being used dates back to late 2014 in Syria’s Deir ez-Zor city. 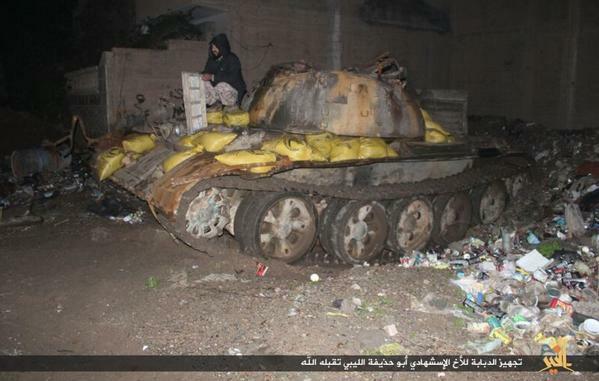 On December 3, an SVBIED based on a Soviet T-55 tank was used by IS to strike a Syrian loyalist position in the city’s al-Rusafa neighbourhood. The turret was still attached, but the barrel had been removed, likely in order to facilitate the driver’s navigation through the relatively narrow city streets. 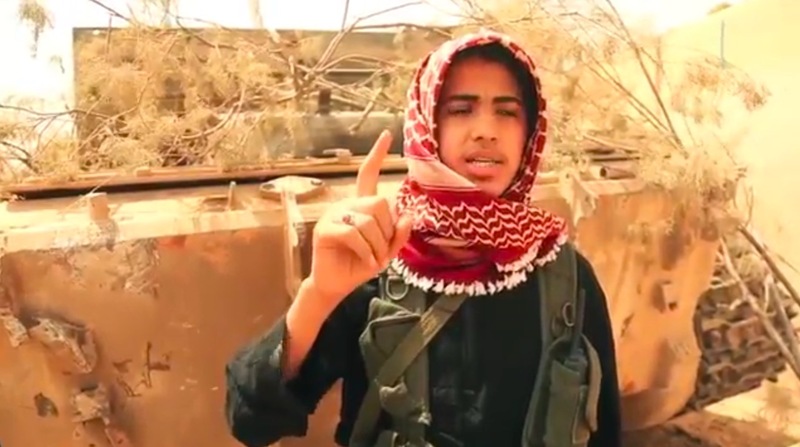 The second case of a tank-based SVBIED was featured in an official IS video from “Wilayah Khayr”, home to Deir ez-Zor city, that was released on May 11, 2015. This example was also a T-55, and similarly retained its turret while missing its barrel. 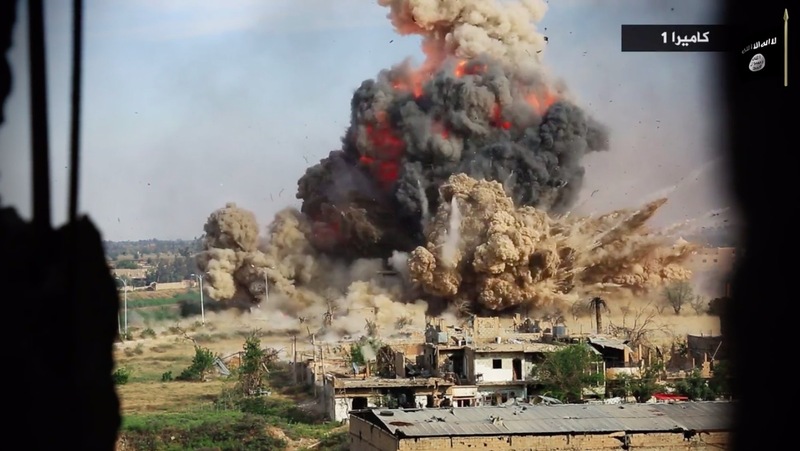 Even though MBTs have a smaller carrying capacity for the explosive payload when converted to SVBIEDs compared to the more commonly used BMP-1 armoured personnel carrier, the detonations can still be catastrophically devastating, as evidenced by the blast seen above. 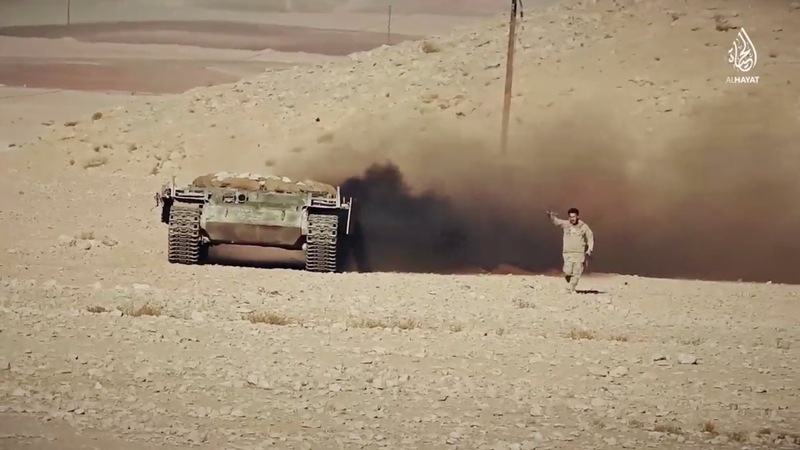 In an official IS video from the same wilayah, released no more than 4 months later (on September 20, 2015) the rear of another SVBIED based on a Soviet-made T-55 was briefly shown. In early November the same year, the next example was put into play. 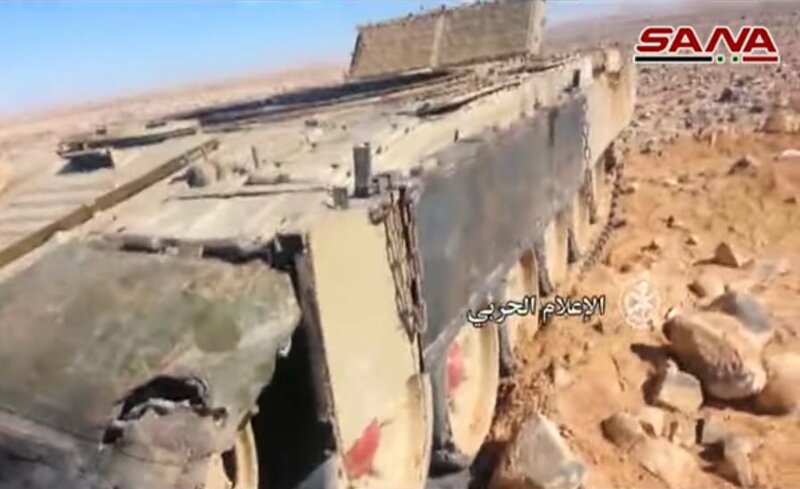 Continuing in the same fashion, it was yet another SVBIED based on a T-55, and was similarly used against a Syrian loyalist position in Deir ez-Zor (near the airbase). This was the first time the entire turret had been visibly removed from the hull. This example was also included in a January 13, 2016 official IS video from the area. 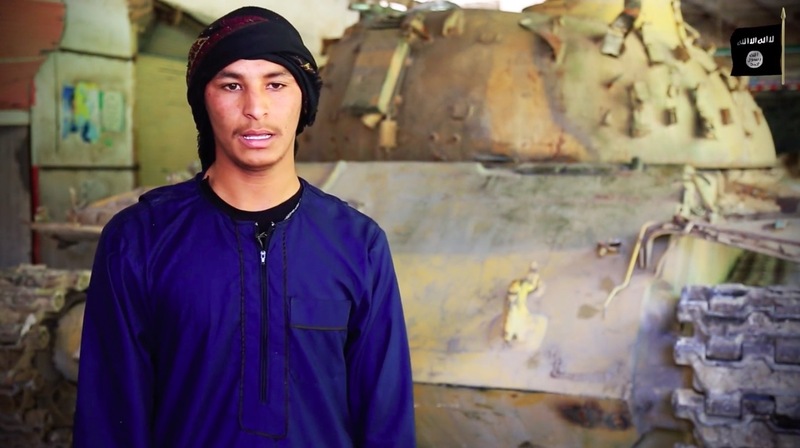 This specific case actually revealed quite a bit about the employment of tank-based SVBIEDs. Looking at the first picture, the identifying black seal of “The Workshop” near Raqqah is visible on the lower front plate of the T-55. This means that the tank was not originally intended to be used as an SVBIED. After being overhauled and marked in Raqqah, it was transported to and used in its stated role in Deir ez-Zor, where it likely sustained barrel or turret damages before being converted into an SVBIED in the field. This reinforces the argument that MBTs are for the most part only used as SVBIEDs if they can’t be used in their stated role. That wasn’t the only time that an MBT overhauled in “The Workshop” had later been converted to an SVBIED. 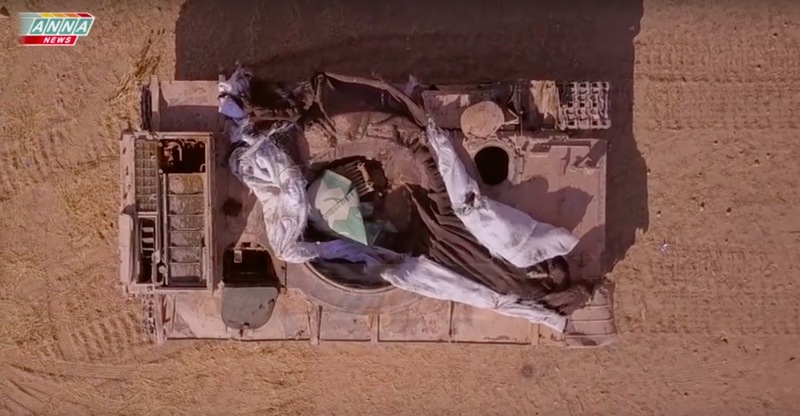 In early July 2016, an up-armoured T-62 SVBIED was taken out by a US airstrike as it surveyed the frontline South of Manbij in the Northern Aleppo countryside in search of a YPG target. 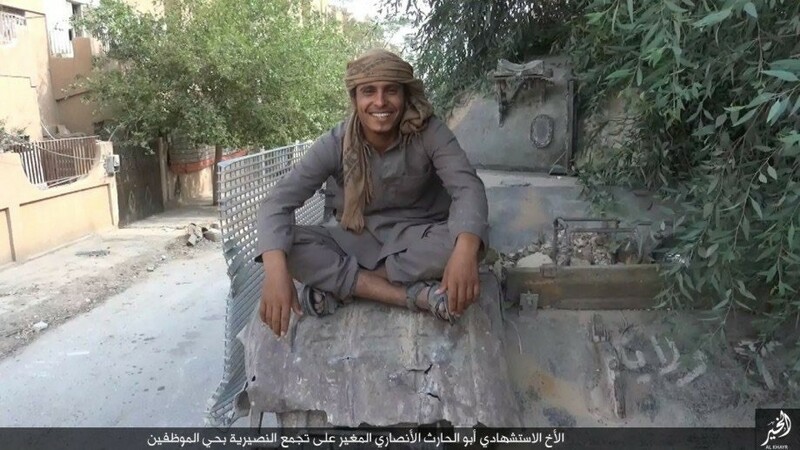 This tank also bore the identifying seal of the Raqqah workshop, and had been upgraded with side slat armour. The turret of this MBT had also been removed. 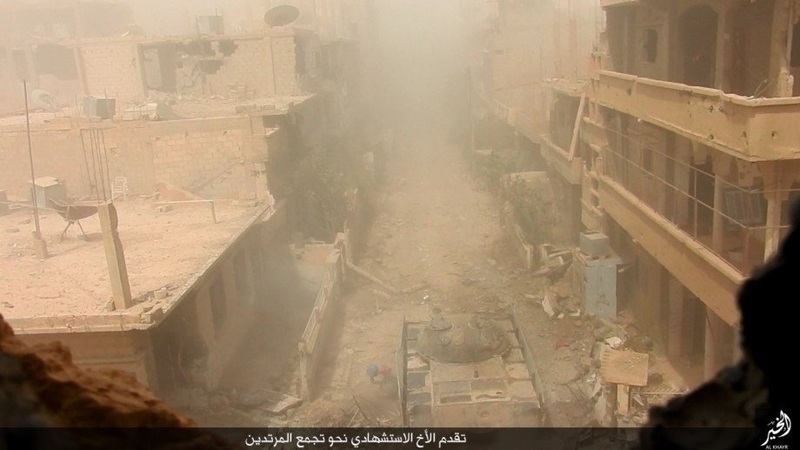 Two months later, in early September 2016, the IS contingent in Deir ez-Zor city used yet another tank-based SVBIED. This time, they employed a Soviet-made T-62 up-armoured with side slat armour and with the barrel removed. At this point, 5 out of all 6 tank-based SVBIEDs had been used by IS in Deir ez-Zor. In early December 2016, IS managed to recapture Tadmur and Palmyra, a symbolic town with an attached ancient city located in the desert approximately 200 kilometres to the Southwest of Deir ez-Zor city. 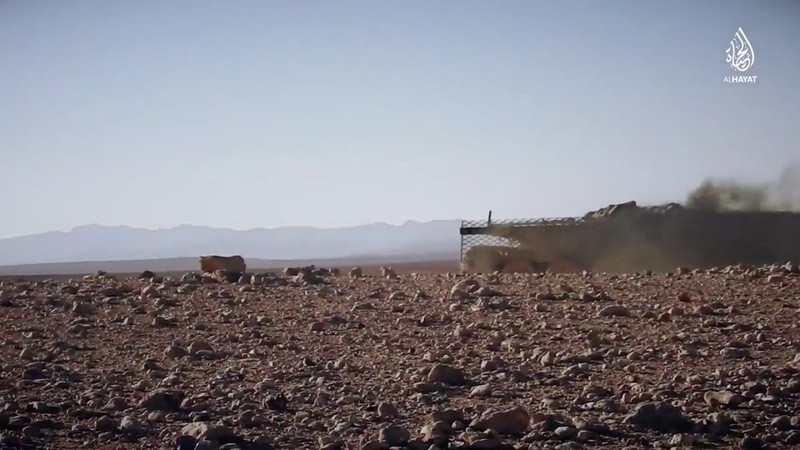 As part of this successful offensive, IS employed an up-armoured T-62 SVBIED with side slat armour against a Syrian loyalist position near the grain silos East of Palmyra. 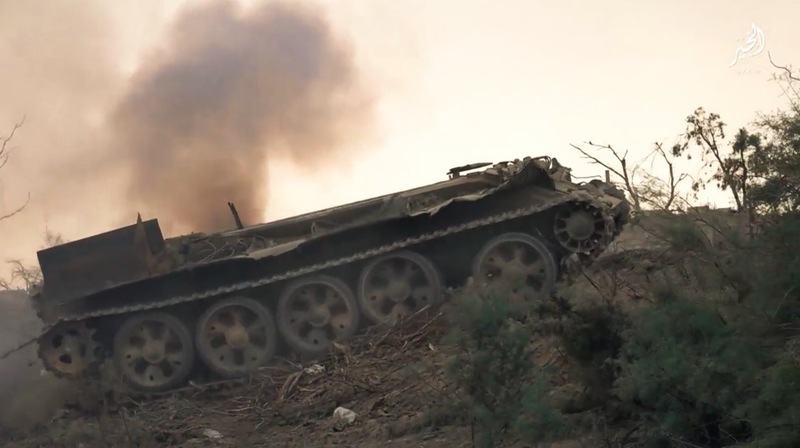 Footage of this specific T-62 SVBIED was also featured in the second iteration of the “Flames of War” official IS video series. After the Iraqi Army managed to completely retake Eastern Mosul in Northern Iraq from IS by late January 2017, combing operations resulted in a remarkable find. 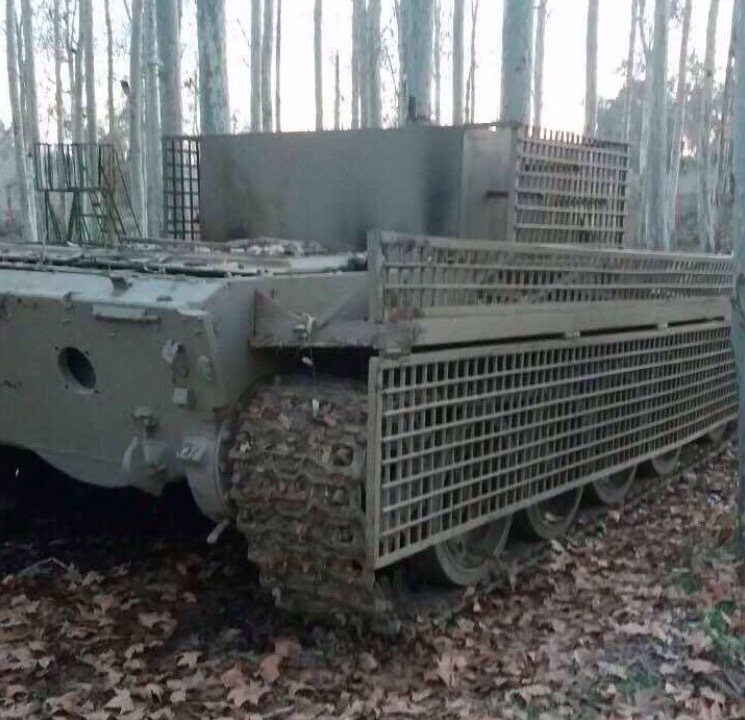 In early February 2017, Iraqi forces discovered a Chinese-made Type 69 MBT in a small wooded area that had been converted into an SVBIED. The turret had been removed from the hull, which was also fitted with side slat armour. This is the only recorded instance of an SVBIED based on an MBT in Iraq, and the only instance overall where a Chinese-made tank was used. 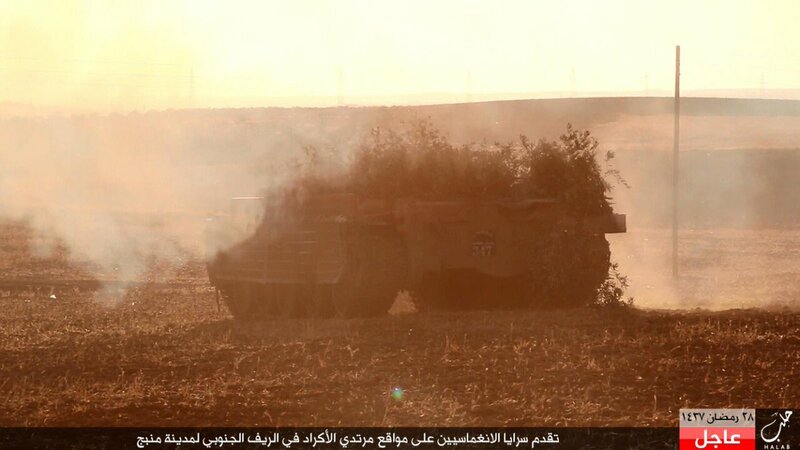 Just a few days later across the border in Syria, another unique tank-based SVBIED was employed by IS. By early February 2017, IS had positioned themselves very close to the perimeter of Syrian loyalist-controlled al-Seen airbase in Damascus countryside. In an effort to seize the base, IS sent the first and so far only recorded SVBIED based on a T-72. However, the MBT failed to explode and was instead seized by loyalist forces guarding the base. In this case, the turret had similarly been removed from the hull. 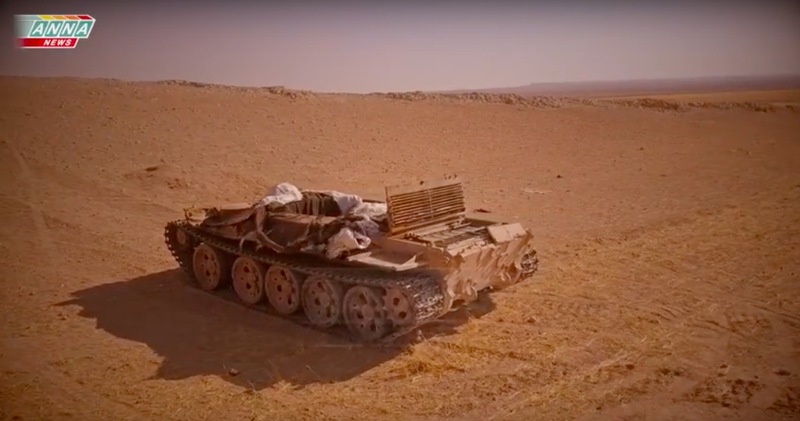 As Syrian loyalist forces swept across the central and Eastern Syrian deserts in the latter half of 2017, they managed to seize and destroy a large number of armoured vehicles and SVBIEDs operated by IS. In early September 2017, loyalist forces captured an SVBIED based on a T-55 near Taybah, West of Deir ez-Zor city. In this case, the turret was also removed from the hull. 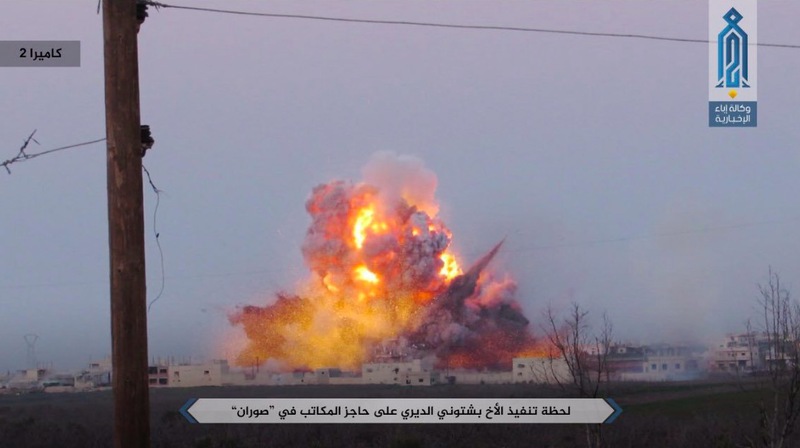 This was also the last recorded example of MBT-based SVBIED use by IS. A number of conclusions can be drawn here. The overwhelming majority of all SVBIED attacks based on MBTs have been carried out in Syria, more specifically in the Deir ez-Zor region. The fact that almost all tanks were Soviet-made ties in to that as well. In my first ever article examining IS use of SVBIEDs, I was able to establish that most military armoured vehicles converted by IS to SVBIEDs were used in relative close proximity to the area in which they were captured in the first place. For example, since the Syrian army almost exclusively uses Soviet-made armoured vehicles and MBTs (such as the BMP-1 variants, T-55s, T-62s, T-72s, etc.) most of the SVBIEDs based on those vehicles that IS have used, have been used locally in Syria. The same is true for Iraq as well. Since the Iraqi army mainly operates US-made armoured vehicles (such as HMMWVs, M113 APCs, and the M1A1 Abrams MBT), most of the SVBIEDs based on those vehicles that IS have used, have been used in Iraq. The reason why there hasn’t been an IS SVBIED based on an Abrams MBT is because of the relative difficulty of piloting it, combined with the complex technical upkeep required to keep such a vehicle running. IS are aware of that, and would much rather detonate or set ablaze a captured example instead of attempting to salvage it. If an Abrams is difficult to pilot, then Soviet-made armoured vehicles are on the other side of the spectrum. 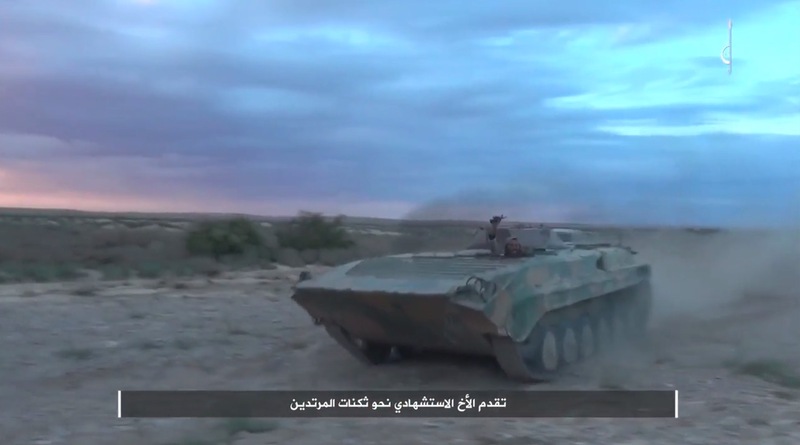 These vehicles were purposely built to be as easy as possible to drive, so the BMP-1 or any of the Soviet-made MBTs hence require little training for a prospective SVBIED driver chosen to pilot any of them. As was mentioned before, most of the SVBIEDs based on MBTs have been used in Syria. However, IS are not unique in having employed this specific SVBIED type. 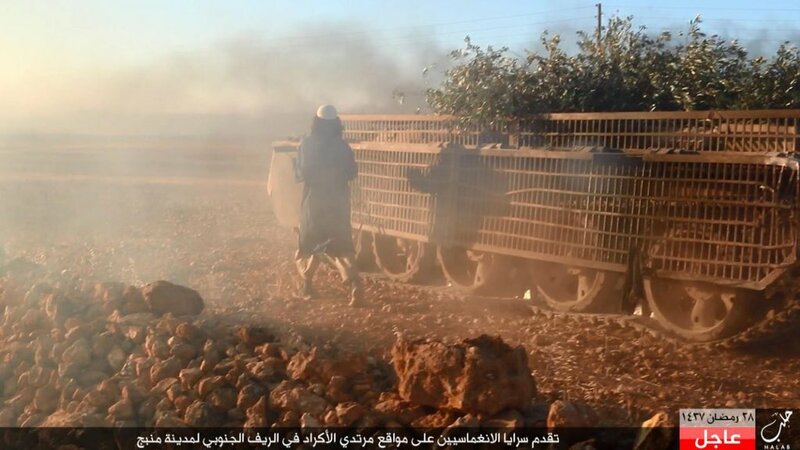 Hayat Tahrir al-Sham (HTS/ex-Jabhat al-Nusra) have similarly used tank-based SVBIEDs, though few in numbers. Interestingly enough, their total use of military armoured vehicles showcases just how sparsely MBTs are sent off packed with explosives. 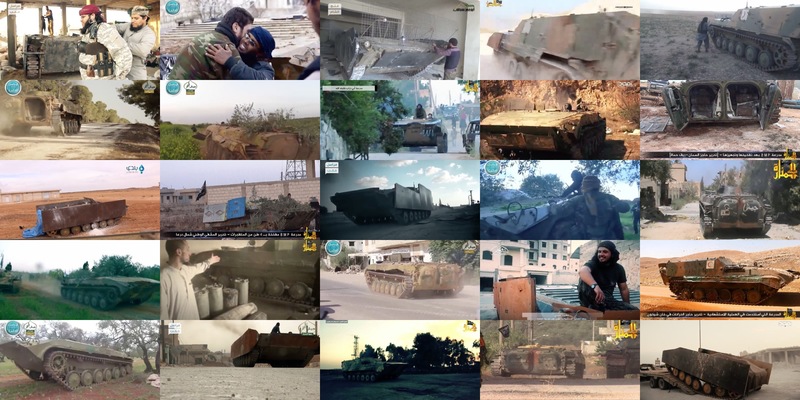 Since the beginning of the Syrian Civil War, HTS and its auxiliary forces have claimed around 230 (S)VBIEDs, 150 of which have been visually documented. At least a third of those (50) were based on the Soviet-made BMP-1 or its ambulance variant, the BVP-1 AMB-S. Half of those can be seen in the below collage. Despite its relatively small total output of SVBIEDs, HTS and its auxiliary forces have used a much larger share of SVBIEDs based on BMP-1 variants than IS have. Even so, they have only ever used 2 tank-based SVBIEDs. The first time they did was during the second (failed) attempt at lifting the siege of Aleppo city. 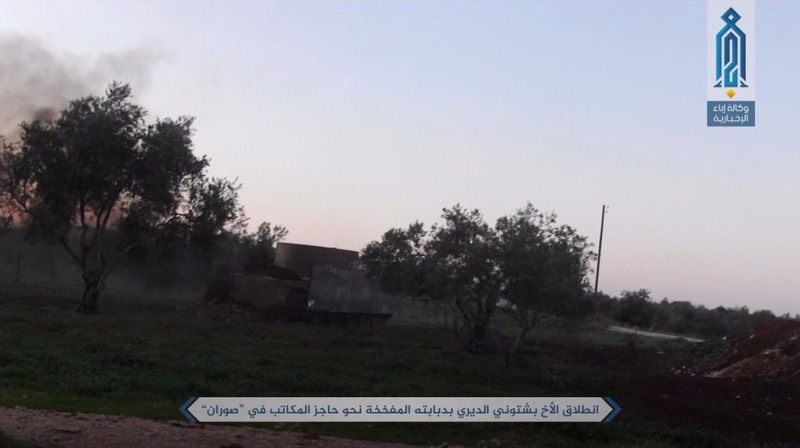 The initial phase was commenced on October 28 2016, when HTS (then Jabhat Fateh al-Sham/JFS) used an up-armoured T-62 SVBIED to strike a Syrian loyalist position on the outskirts of Western Aleppo. 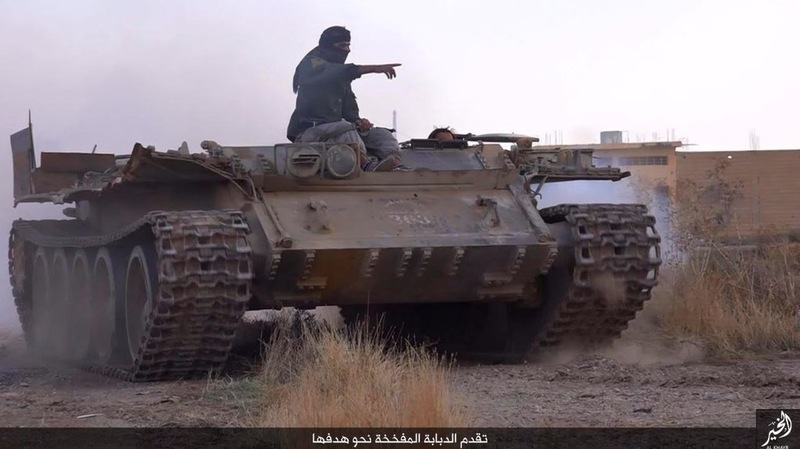 The vehicle had received side metal armour, a standardised feature of most HTS APC/MBT-based SVBIEDs. Each side of armour consists of two plates fitted with some spacing in between them. It also appeared as if the turret had been replaced with improvised armour plating meant to shield an expanded payload emplacement. The second (and final) use of MBT-based SVBIEDs by HTS took place in Northern Hama five months later, on March 21, 2017. 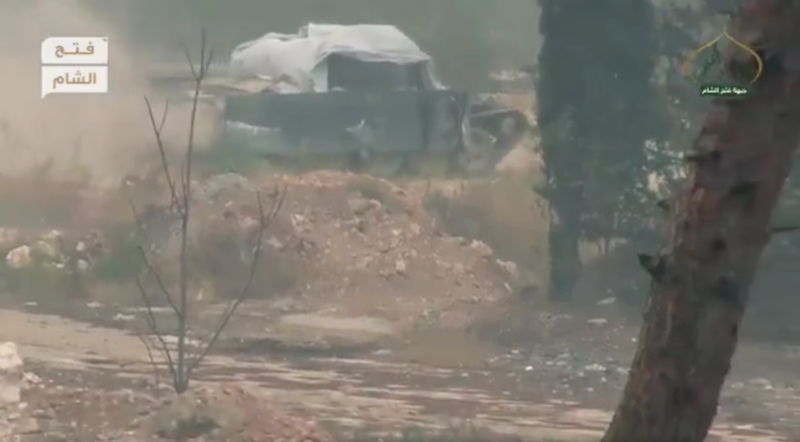 As part of a (failed) effort to expand their territorial holdings in the region, HTS sent out its second up-armoured T-62 SVBIED toward a Syrian loyalist position near the town of Souran. Visually speaking, this example looked very similar to the first one seen in Aleppo, though this time it was also fitted with a set of frontal slat armour. Both of these SVBIED attacks were conducted at a time when HTS (then JFS) had already seriously depleted their armoured personnel carrier stocks, and their use was a prelude to HTS mostly reverting to using a series of standardised up-armoured pick-up truck SVBIEDs instead of ones based on military armoured vehicles. 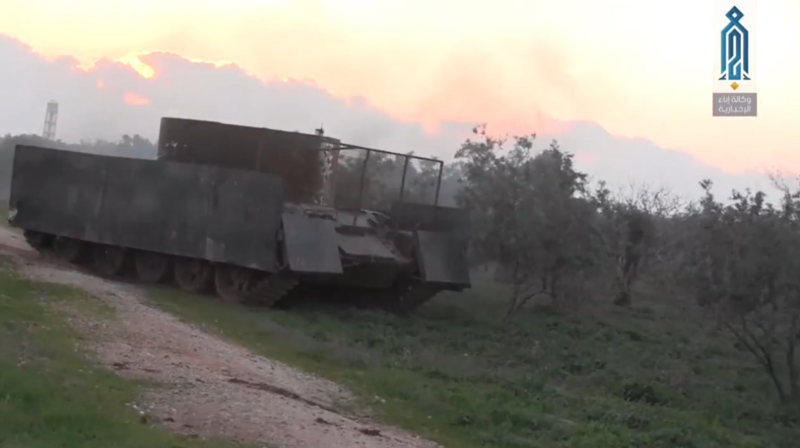 In conclusion, it appears that main battle tanks (MBTs) are only converted to and employed as SVBIEDs as a last resort. Damages to the tank’s barrel or turret rendering it inoperable in its stated role seems to be the most common reason for using the hulls of the damaged vehicles in a more useful role. However, a small percentage of the MBTs used for this purpose seem to have been intact and operational when converted for this purpose, making the reason for choosing that vehicle more likely to do with a local scarcity of more suitable armoured vehicle hulls. 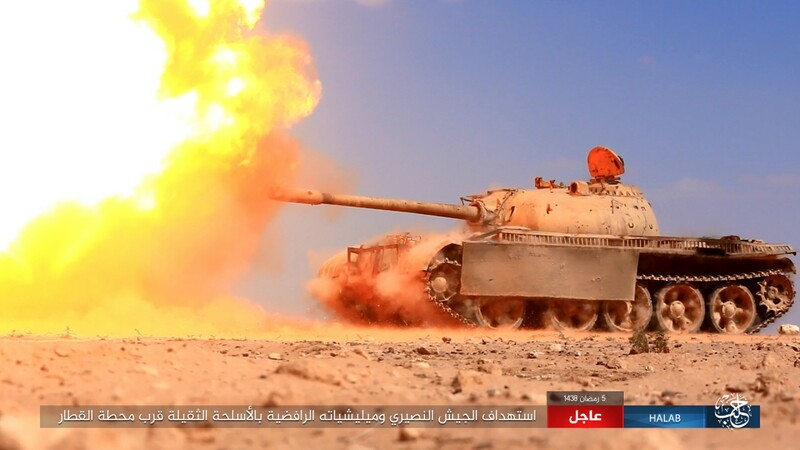 IS and HTS are both far more likely to employ a seized MBT in its stated role, but it seems as if they’re both applying the same type of logical reasoning of not letting anything go to waste if and when their MBTs are rendered inoperable due to a hit on the barrel or turret.